Delivering revolutionary innovation with in-house design from the ground up, Arecont Vision® launched the world’s first quad-sensor 180° and 360° seemlessly-aligned panoramic megapixel IP cameras in 2006. The Arecont Vision® SurroundVideo® multi-sensor, multi-megapixel cameras can each replace multiple conventional or pan-tilt-zoom cameras. With numerous industry firsts and innovations in multi-sensor, multi-megapixel technology, Arecont Vision® SurroundVideo® remains the leader with our 5th generation joining the lineup. SurroundVideo® series multi-sensor, multi-megapixel cameras provide an all-in-one solution for capturing wide area video surveillance while maximizing the field-of-view and reducing the total number of cameras required. 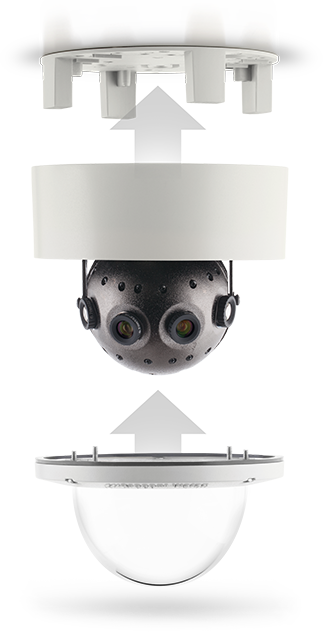 SurroundVideo® cameras include four sensors uniquely housed in an IK-10 impact-resistant, IP66 environmentally-rated dome enclosure. Models are available in 180° and 360° panoramic configurations with resolutions of 5MP, 8MP, 12MP, 20MP, and 40MP. With the SurroundVideo® Omni, each of the four individual sensors are user-configurable to combine different lens options and positions around the magnetic track. Delivering seamless and stunning 180° to 360°coverage, Arecont Vision® SurroundVideo® panoramic IP megapixel cameras capture the full horizontal field-of-view. The SurroundVideo® Omni IP megapixel camera demonstrates ground-breaking versatility with its magnetic Omni track design encompassing 73 sensor positions and multiple lens options for endless configurations. Capturing a full 360° field-of-view, Arecont Vision® SurroundVideo® 360° panoramic IP megapixel cameras can be strategically placed to capture important details. Arecont Vision® IP megapixel technology delivers superior image quality and reduces overall system cost by covering large areas with fewer cameras with outstanding clarity. An area typically requiring multiple pan-tilt-zoom (PTZ) or fixed cameras can be covered with a single SurroundVideo® series camera. 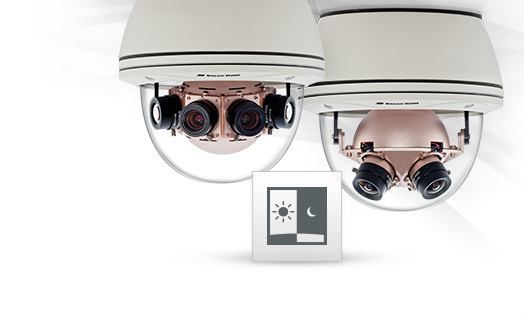 SurroundVideo® panoramic multi-sensor cameras easily capture moving objects throughout the day and night, delivering comprehensive coverage and forensic detail all without the need of an operator. 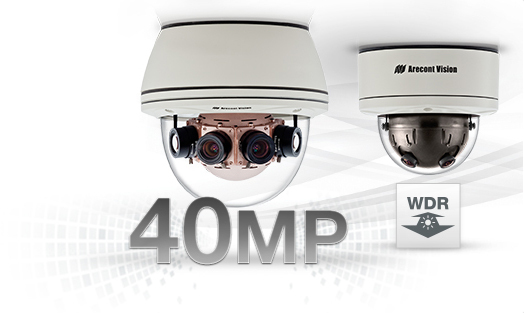 SurroundVideo® series cameras are available in 5MP, 8MP, 12MP, 20MP, and 40MP resolutions. Four stationary cameras attempting to fully cover a corner. One SurroundVideo® Omni IP Megapixal Camera, with 270° coverage, including directly below the camera for no blindspots. The SurroundVideo G5 Mini housing features magnetic strips around the base to make mounting a snap. The top of the camera’s base magnetically attaches to the pre-installed surface mount plate, while the bottom of the base magnetically snaps to the bubble. This temporary magnetic solution holds the components in place while applying the screws and freeing your hands for a faster, easier installation. This makes SurroundVideo G5 Mini one of the easiest panoramic cameras to install on the market. Beginning in 2006, Arecont Vision® pioneered the first 180° and 360° multi-sensor megapixel (MP) panoramic IP cameras, and has been leading the industry in multi-megapixel, multi-sensor technology ever since. 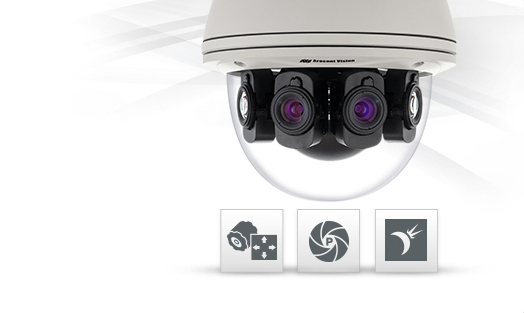 World’s First 180° and 360° Panoramic 8 Megapixel Network IP Cameras. In May of 2006, Arecont Vision® released the AV8360, the world’s first quad-sensor 360° panoramic megapixel IP camera. In September of the same year, the AV8180 was released, becoming the first megapixel camera in the industry to have four seemlessly-aligned sensors to create a full panoramic 180° field-of-view coverage and pioneering the innovations to come. 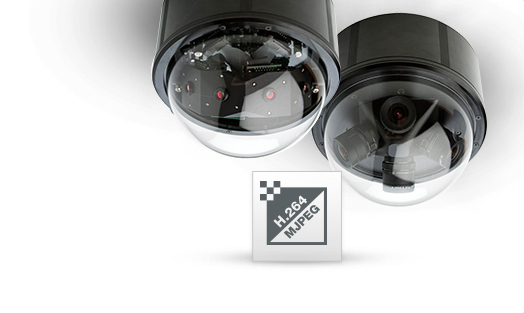 World’s First H.264 180° and 360° Panoramic 8 Megapixel Network IP Cameras. In October of 2008, Arecont Vision® released updated 180° and 360° panoramics (AV8185 and AV8365) that featured H.264 compression, a first of it’s kind among panoramic technology in the IP megapixel surveillance industry at the time. SurroundVideo® True Day/Night 8 Megapixel H.264 Panoramic 180° and 360° IP Cameras. In December of 2010, Arecont Vision® Panoramics were given the name “SurroundVideo®” and re-engineered with a new design. They are now IK-10 impact resistant and IP66-rated against dust and water. The AV8185DN and AV8365DN are the first panoramics in the industry to feature True Day/Night for strong low-light coverage. SurroundVideo® True Day/Night 20 Megapixel H.264 Panoramic 180° and 360° IP Cameras. In April of 2011, the SurroundVideo® made the jump to 5 megapixel (MP) sensors for a total resolution offering of 20MP. The AV20185DN and AV20365DN had the highest megapixel rating in the IP camera industry at this time. SurroundVideo® WDR 12 Megapixel H.264 180° Panoramic IP Camera with True Wide Dynamic Range. In October of 2012, SurroundVideo® WDR (AV12186DN) made its debut featuring a new smaller housing and wide dynamic range (WDR) functionality. The SurroundVideo® WDR became the first true wide dynamic range (WDR) 180° panoramic camera in the IP security industry. 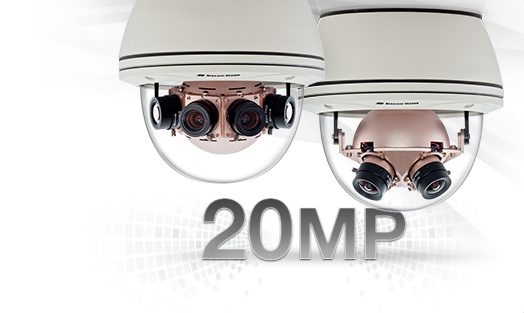 SurroundVideo® 40 Megapixel 180° Panoramic and SurroundVideo® WDR 12 Megapixel 360° Panoramic. In 2013 back-to-back months, the 40MP SurroundVideo® was released in August featuring the highest megapixel rating ever for a panoramic IP camera. The 360° 12MP SurroundVideo® WDR was released the following month as the first 360° panoramic with true wide dynamic range (WDR) functionality. SurroundVideo® Omni – World’s First Multi-Sensor Omni-Directional User-Configurable IP Megapixel Camera. 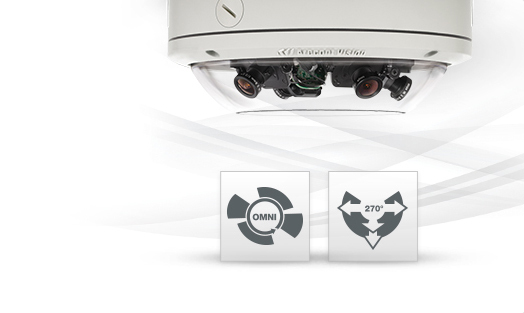 In June of 2014, SurroundVideo® Omni becomes the first multi-sensor IP megapixel camera that is user configurable. Offering seemingly endless configuration possibilities between its omni track design and and multiple lens options that can be mixed and matched for each sensor, SurroundVideo® Omni is the first and only IP megapixel camera that allows this level of versatility on the market today. SurroundVideo® G5 – World’s First 5MP, 12MP, and 20MP 180° Panoramic with Remote Focus and STELLAR™. In June 2015, the all new SurroundVideo® G5 5th generation series brought a new design featuring remote focus P-iris lenses for easier installation, a first for the IP megapixel camera industry. Another industry first, the SurroundVideo® G5 offers a 5MP STELLAR™ (Spatio Temporal Low Light Architecture) Technology model that provides full-color imaging in near complete darkness, making it one of the most advanced panoramics on the market. Installer-Friendly 180° and 360° 20MP Panoramics. 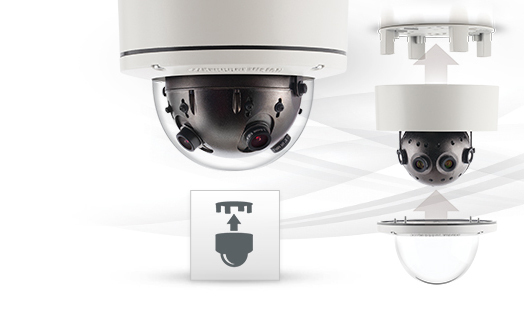 In August 2016, SurroundVideo® G5 Mini introduces an intuitive housing design for Arecont Vision’s mini panoramic line up that allows for faster and easier installation. SurroundVideo G5 Mini is also the first 20MP panoramic available in a form factor this small in size. The SurroundVideo® G5 series features a P-iris motorized lens to easily focus each of the camera's sensors. Once mounted, the operator can quickly focus and position the camera remotely. This eliminates the need to adjust the camera while on a ladder. The simplicity of clicking “short range focus” or “full range focus” saves both time for installers and money for end users. 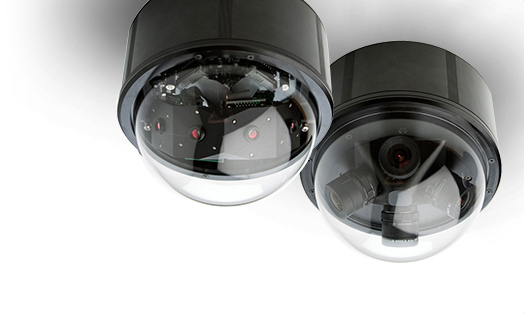 SurroundVideo® G5 IP megapixel cameras feature a factory-installed precision iris or “P-iris” lens. This ensures the best possible depth of field and image clarity for precise performance from each individual sensor. The P-iris lens provides an automatic, precise iris control for applications with varying lighting conditions. Advanced Low-Light Technology for Noise Reduction and Enhanced Color Imaging in Near Complete Darkness. STELLAR™ technology is “Spatio Temporal Low Light Architecture” which allows for color imaging in near complete darkness. Arecont Vision® STELLAR™ technology utilizes a patented algorithm that reduces noise, motion blur, bit rate, and storage requirements. STELLAR™ has superior low light sensitivity, making it capable of covering areas where very little light is present. In extreme lighting conditions, it can be challenging to capture the best of the brightest and darkest parts of a scene. The 12MP SurroundVideo® Series cameras feature Wide Dynamic Range (WDR) technology to produce clear images in harsh lighting conditions. 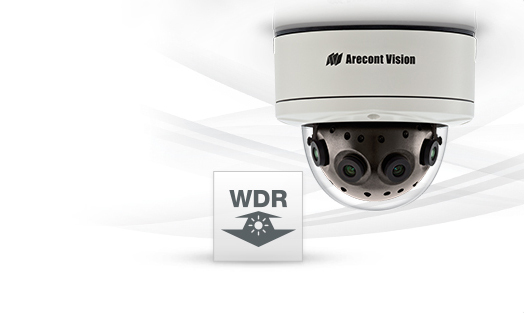 The Arecont Vision® WDR technology generates two images. One is a long exposure for the darkest areas of the scene, and the other a short exposure for the brightest areas. The camera then combines the images to produce a perfect exposure, revealing details previously unseen. The SurroundVideo® series incorporates a mechanical IR (infrared) cut filter for the highest image quality at any time of day. The true day/night technology ensures vivid images during the day and optimum monochrome performance at night. It instantly switches between modes based on the scene’s illumination. 55 kg (120 lbs) of force.